In a separate entry about the anniversary of the Hindenburg disaster (May 6, 1936), I noted that there was an episode from WWI that linked the giant airships of those days to the city of Naples; I linked that sentence to this entry about a Zeppelin attack on Naples in 1917. Thanks are due to friend Peter H. who reminded me that there was something else —someone else, really— who linked the city to those great ships of the early part of the 20th century; specifically, "General Nobile." Indeed, very few Italians in the field of science and technology have had as much space dedicated to them in print, film, TV documentaries, museum exhibits, etc. as Umberto Nobile. Nobile was an early designer of airships and then, most notably in the public consciousness, an intrepid arctic explorer. I can think of a number of prominent museums with space dedicated to his exploits: one is the Museum of Science and Technology in Milan; another is the Italian Air Force Museum in Rome, and the third is in his home town of Lauro in the province of Avellino, just a few miles from Naples (in this case, the whole museum is just for him). Also, the Italian National Council for Scientific Research] maintains an arctic research station at Kings Bay (Ny-Ålesund) in the Spitsbergen (Svalbard) archipelago; the station is named Italia after Nobile's airship, involved in the famous expedition in 1928 described below. Nobile graduated with honors from the University of Naples with degrees in electrical and industrial engineering. (He would later hold a faculty position for many years at that same university.) In 1906 he began working for the Italian state railways, where he worked on the electrification of the rail system. 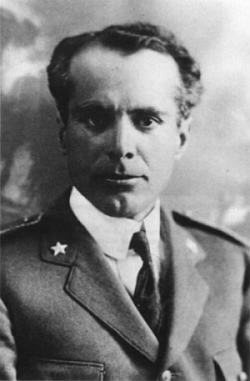 In 1911 he turned to aeronautical engineering and took a one-year course offered by the Italian Army. He was fascinated and inspired by the work of airship pioneers such as Ferdinand von Zeppelin. Nobile was commissioned an officer in the Italian air force during WWI and went to work designing his first semi-rigid airships* for the war effort. (The Italian military had already used airships as early as 1912, during the Italo-Turkish War.) His main interest was in the design of airships for long flights over water and to the arctic regions. *Semi-rigid means that the envelope —the gas bag— had some form of supporting structure, such as a fixed keel, attached to it. This, as opposed to the famous Zeppelins (such as the Hindenburg), which were rigid; that is, they had an outer structural framework. Non-rigid airships, called blimps, are just large balloons, an envelope inflated and held in shape by the internal pressure of the lifting gas, almost always hydrogen in the European craft of the early twentieth century. In 1923 Nobile went to the US for a year to be a consultant for the Goodyear corporation in Akron, Ohio. These were the days of other famous arctic and antarctic explorers such as Norwegian Roald Amundsen (who had reached the south pole in 1911) and American Richard Byrd. The competition was intense to be the first to get to the North Pole either by setting foot on the spot or at least flying over it by plane or airship. Amundsen had flown close by plane in 1925, and Byrd claimed to have flown over the pole that same year, but doubts later surfaced about the claim. 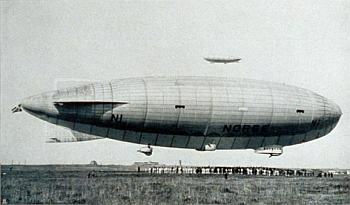 Amundsen then teamed up with Nobile to have a joint Norwegian-Italian run at the pole aboard an airship of Nobile's design, named Norge (photo, below). They left Rome on 10 April, 1926, stopped at Pulham (England), Oslo, Leningrad, Vadso (Norway), arriving at the Norwegian station at Kings Bay in the Svalbard (also Spitsbergen) archipelago, well north of the arctic circle on 7 May. This was their real point of departure. They flew over the North Pole on May 12 and landed in Teller, Alaska on May 14. From Spitsbergen to Alaska is 2,000 miles (3000 km) non-stop right over the top of the world—nothing but ice. Be impressed! (It was, alas, short of their goal of Nome, Alaska, so the idea to call the whole trip "Rome to Nome" had to be abandoned! What a shame!) 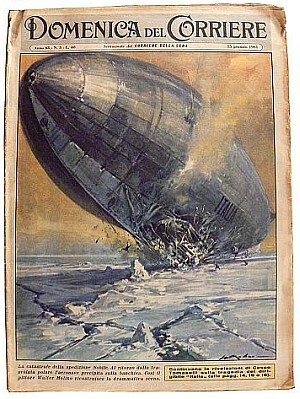 The airship, itself, was damaged during the landing and was dismantled. Nobile's feat was a propaganda victory for Italy and the Fascist regime. He was well received back in Italy and was promoted to the rank of Lt. General in the Italian air force. He decided to repeat his voyage in 1928 with the airship, Italia, also of his own design. The ship was 105 meters long, powered by three Maybach motors and had a top speed of 115 kmh/70mph. The voyage ended in disaster. The ship crashed onto the arctic ice pack, and the subsequent two-month international rescue mission became one of the most riveting news stories of the early twentieth century, with Nobile at the center of attention. The ill-fated Italia, indeed, did reach the North Pole on May 23, 1928 and was on the way back when it went down onto the ice on May 25 off the coast of Foyn island in the Svalbard group. Of the 16 men in the crew, ten were thrown onto the ice as the ship smashed onto the surface. The crash was probably due to extreme weather and a build-up of ice on the envelope of the ship. The crash ripped the gondola from the huge fabric-covered superstructure, and the remaining six crewmen, trapped in a portion of the still buoyant superstructure as it now ascended skyward, were lost. (The crew of the Soviet ice-breaker, Krasin, later reported seeing explosions in the sky at the time.) The rest of the crew managed to survive for weeks on the ice thanks to supplies (including a radio!) that they had jettisoned as they were going down. They lived in a small tent that they had managed to toss over the side. A grand international rescue mission was set in action, which resulted in the event that hung over Nobile for the rest of his life. The search for the wreckage of the Italia and her crew was on. It took a month to find them, at which time a lone Swedish rescue plane, landing on ice-skids, landed with orders to take Nobile first and then go back for others. The pilot, one Lt. Lundborg, intrepid enough, himself, said truthfully that the plane would never take off with the weight of even one more person. (On his second flight back in to get another passenger, Lundborg crashed and had to be rescued with the others, which came about on July 12 thanks to the Krasin. In all, eight of the original crew of the Norge crew died. All were injured to some extent. The survivors had spent seven weeks on the ice in their shelter, nicknamed The Red Tent (also the name of a 1969 feature film about the event and an article of that name, authored by Nobile, himself). It is difficult, even today, to figure out exactly what happened. Events happen, let's say, "objectively": Ship crashes. Captain is rescued. Others are eventually rescued. The interpretation of these events is called "history" and that is anything but objective. I offer no judgment because I wasn't there, and even the reports of those who were there are confusing). At an official inquiry in 1929, Nobile was found responsible, in large part, for the crash. He denied all blame and resigned his commission from the air force after the inquest. He went to the USSR in 1931 for four years to help build Soviet airships; from there, he went to the United States where he taught engineering. He returned to Italy only in 1943 after Italy had surrendered to the Allies in WWII. Nobile was officially "rehabilitated" by a board of inquiry in 1945, and his rank was reinstated. He returned to a teaching position at the university of Naples. from an Italian newspaper of the day. Nobile wrote often about the episode, including I Can Tell the Truth in 1945, saying that the Fascist board of inquiry had been rigged against him, perhaps even that the regime had set him up to be slandered by ordering him to be first off the ice. Nobile, in spite of his popularity with the people, indeed had many enemies within the Italian air force. These great airships were now increasingly viewed as an anachronism. Although airships would have another decade of quaint glory (until the Hindenburg disaster in 1936), the various military establishments in the world knew that the future of aviation—at least bellicose aviation—was in airplanes, not airships. That faction within the Italian military may have used the Italia disaster to cut off Nobile and his airships. Nobile had abandoned his crew, they said, and that is absolutely the worst thing you can say about any captain of any ship. He also had political problems. He had never been an ardent Fascist. (He worked for Stalin, for heaven's sake! So much for that "Fascist General" bit of doggerel.) Nobile was, in fact, a Communist, and was even elected on that ticket to the post-war Italian parliament. Over the decades since the crash of the Italia, an enormous amount of literature has been written about the topic, not just by Nobile, himself, but by members of the crew and by those who took part in the rescue operation. Books and articles range from the technical (exactly why did the ship go down? Might a rigid airframe have survived better than a semi-rigid one?) to the ghoulish (maybe those two ice-walkers, eventually picked up by an ice-breaker, survived only because they had cannibalized the third member of the party!) to the snide ("I see the general managed to get his dog out before his men.") Indeed, poor little Titina, the mascot, a small Fox terrier (and the first and only dog to fly to the North Pole!) accompanied her master everywhere. Good for her that all of her 10 lbs. got away on the first rescue flight; otherwise that evening she might have been the main course, the pooch-du-jour, on the marooned survivors' menu.) Post-war opinion on the episode has now settled out and, by and large, has been benevolent to Nobile. 00:24 (24 May, 1928) - The Italia reaches the North Pole. The flight from King's Bay has lasted 19 hours and 52 minutes. The trip was facilitated by tailwinds. Bad weather prevents a landing party from disembarking. The New York Times reports: KINGS BAY, Spitsbergen, May 24 - Coated with much ice and fighting a strong southwest wind, the dirigible Italia was slowly making her way back to her base at Kings Bay today after a brilliant flight to the North Pole. 02:20 - Return trip starts. Headwinds now prevail. Nobile calculates a return time of 40 hours. After 24 hours, the Italia has only reached the halfway mark. Heavy fog. Strong headwinds. Ice has started to form on the engine propellers. Shards of ice break off and spin into the fabric of the envelope. 09:25 (25 May) - The elevator (the hinged horizontal airfoil that moves the ship up and down) has iced over and stuck in the down position. The Italia is now “prow-heavy” (i.e., tilted with the nose lower than the tail). It is 300 meters above the ice. Nobile stops the engines to let the ship float up to 950 meters, above the cloud cover, in order to expose the envelope to direct sunlight and melt the ice. The heat will expand the hydrogen, which can be controlled by venting valves. 09:55 - This apparently works. The ice is gone and the ship restarts two of the three motors and descends to 300 meters. Italia is now moving at 45 km per hour. 10:30 - The ship suddenly tilts back towards the tail at an 8-degree angle. Nobile orders full power with the ailerons at maximum elevation. The crash is inevitable. Nobile stops all engines (to avoid a fire on impact); the crew tries, but is unable, to loosen and jettison the ballast chains. 10:33 - Impact. The aft section strikes first and then rocks forward to shatter the gondola. The envelope remains largely intact. Ten of the crew are thrown from the gondola by the impact. The other six are trapped in the still buoyant envelope that now rises and carries them to their deaths. With heroic presence of mind, the crew (including the doomed members in the envelope) keep throwing items of potential use onto the ice as they go down, including the tent and supplies that were to have been used on the aborted landing at the pole, itself. The Italia came down at 81° 14' N - 28° 14' E, or about 100 km (60 miles) to the NE of the Svalbard islands, their destination. They had covered over 1,000 km from the pole and from altitude were in sight of the mountains of the Svalbards. They almost made it. March 14, 1929, [the NYT reports that] Nobile resigns from the air service...in order to vindicate himself, saying "The first intimation I had of the findings was publication by the official agency... I had no opportunity to be heard or to refute the charges of faulty manoeuvring of the Italia or faulty composition of the crew. If they would have confronted me with the technical accusations, they could have been refuted. This affair is not yet concluded." ...Captain Lundborg told how Nobile refused to be taken from the ice ahead of five remaining members of the crew who had been in the gondola, which was wrenched from the Italia's framework when she struck... "Upon my insistence," Captain Lundborg continued, "General Nobile agreed to consult with his men about it and came back agreeing to go." [Lundborg hedged on criticizing the committee's report], saying only "I can tell you that the criticisms which have been directed against Nobile for leaving should by all rights be directed against me, for it was I who urged and insisted on his accompanying me first. And so on and so forth. As far as a regime-driven conspiracy to get Nobile out of the picture goes, a relatively recent book, Disaster at the Pole, by Wilbur Cross, (2002) [75 years after the episode!] claims that before the flight, when the ship had crossed from the Norwegian mainland to the King's Bay arctic station, from whence she would launch for the North Pole, the captain of the Italian (!) support ship, refused to send hands ashore to help with the mooring and landing, and that local authorities had to call in miners to help...! Put in those terms, maybe the fix was in to make Nobile fail even before he started. After all, Mussolini's Minister of the Air Force, Italo Balbo, a fervent supporter of airplanes (not airships) and a daring pilot, himself, had openly complained about wasting time and money on Nobile and his dinosaurs. When told that Nobile wanted to go back to the North Pole in 1928, Balbo is said to have responded. "Good. Maybe he won't be back to bother us anymore." So, in 1926 Nobile was a hero; in 1928 not so much. What might have happened? A stray thought: In 1927 Lindbergh flew the Atlantic. Might that not have tipped the balance of public perception in favor of airplanes over airships? Just a thought.